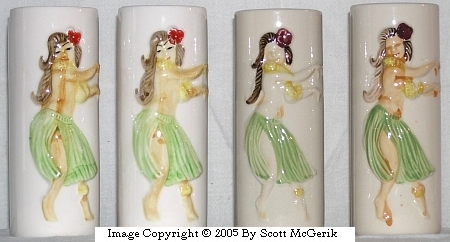 Orchids of Hawaii, now defunct, created dozens of Tiki mugs, along with lamps, carvings, and dishes, for use in Polynesian restaurants and Tiki bars. Orchids of Hawaii went out of business in the early '90's. 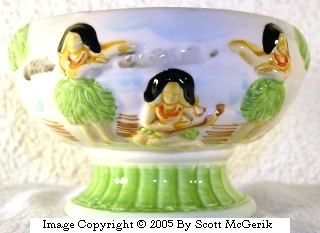 Dynasty Wholesale acquired a number of molds from Orchids of Hawaii and now produces mugs based upon those molds. These vintage Tiki mugs, produced by Orchids of Hawaii, feature the visage of a tattooed Maori headhunter. These glazed ceramic mugs are 7-inches tall and hold 16 ounces. They came in three colors: green, cream, and brown. An identifying mark is the “Orchids of Hawaii” printed on the bottom of the mugs. These mugs were manufactured first in Japan and then Taiwan and typically have the country of origin printed on the bottom. Both of the above mugs were made in Japan. And, most, but not all, R-1 Headhunter mugs have “R-1″ printed on the bottom. If there are no markings other than “China” on the bottom, the mug is probably a Dynasty Wholesale mug. Similar mugs in my collections include an unmarked brown Headhunter mug. This mug can be found on page 13 of Tiki Quest - Collecting the Exotic Past by Duke Carter. Found in the Mug, Orchids of Hawaii, Polynesian Pop, and Tiki Collections. This is the Orchids of Hawaii R-13A Coconut mug. The exterior surface is brown with a bisque finish. The interior is glazed and white. On the bottom of this 15 ounce ceramic mug is “Orchids of Hawaii”, “R-13A”, and “Japan”. 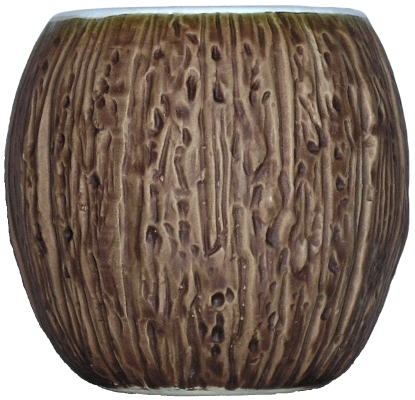 Other coconut mugs in my collection include the Dynasty Wholesale DW116-S Coconut mug. Found in the Mug, Orchids of Hawaii, and Polynesian Pop Collections. This vintage Tiki mug is in good condition, with sharp markings and no chips or cracks, and has green, rhinestone eyes. 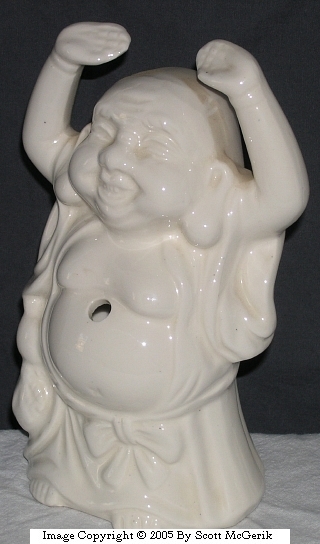 The rim and the base are both glazed while the body has a bisque exterior with a cream base with a brown stain overlay. The 13 ounce mug stands 6 inches tall. On the bottom are the inscriptions “Orchids of Hawaii”, “Japan”, and “R-3″. 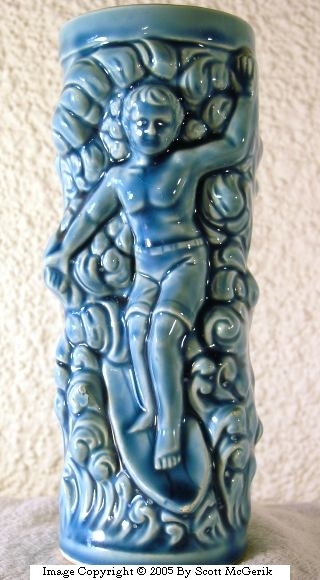 This Tiki mug can be found on page 16 of Tiki Quest - Collecting the Exotic Past by Duke Carter. 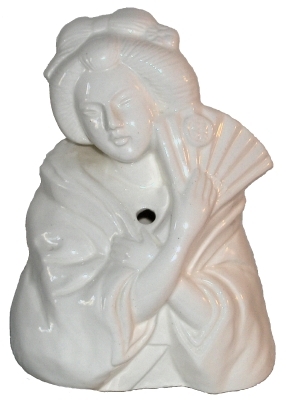 This vintage 13-ounce glazed ceramic, headvase-style mug stands 6 1/2-inches tall. This Tiki mug looks like a miniature Easter Island Moai statue carved from wood. Imprinted on the bottom of the mug is “Orchids of Hawaii” and “Japan”. Similar mugs in my collection include the Dynasty Wholesale DW128 Easter Islander mug and an unmarked brown Moai mug. This vintage ceramic 12-ounce mug stands 6-inches tall. This mug is molded in the semblance of the Hawaiian god Ku, the god of war. Impressed on the bottom is “Orchids of Hawaii R-74″ and “Japan”. Similar mugs in my collections include an unmarked brown Ku mug. 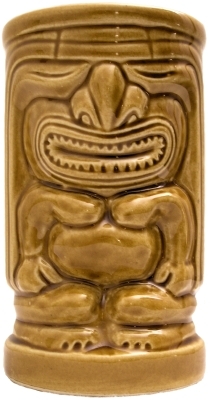 This Tiki mug can be found on page 15 of Tiki Quest - Collecting the Exotic Past by Duke Carter. This vintage, glazed ceramic mug holds 12-ounces and is 6-inches tall. This mug depicts Lono, the God of Peace and Prosperity. This mug has been well cared for and has no chips, no crazing, and no skuff marks in the glaze. Inscribed on the bottom of the mug is “Orchids of Hawaii”, “R-76″, and “Japan”. This mug can be found on page 16 of Tiki Quest - Collecting the Exotic Past by Duke Carter. This vintage brown Tiki mug is in good condition with no cracks or chips. On the bottom of the mug, it reads “Orchids of Hawaii R-91″ and “Japan”. This 13 ounce mug stands 5 inches tall. 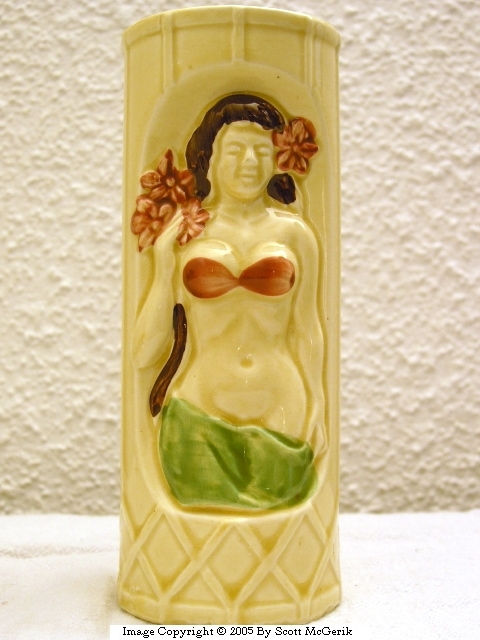 The Leilani mug is one of the more commonly found Tiki mugs. The Leilani mug can be found on page 59 of Tiki Quest - Collecting the Exotic Past by Duke Carter.